Spain has long been one of the go to destinations for golfers looking for some fun in the sun on their annual golf holidays and rightly so. With a large number of golfing hotspots, such as the famed Costa del Sol and the region of Murcia, catering extremely well for travellers from the less exotic climes of the UK & Ireland, there is little wonder that flocks of golfers head here to sample some of the finest fairways in Europe. While the allure of almost guaranteed sunshine, sandy beaches and a relaxed and intoxicating culture, not to mention a bevy of top class accommodation options, is more than enough reason to pay Spain a visit on your next golf break, the fact that it is home to a number of the best golf courses in the world is certainly an added bonus. Famous names like Valderrama, San Roque and La Manga have long been flying the flag for Spanish Golf but more recently another fantastic golf resort has been making waves on the Spanish golf scene. Head West from the Costa del Sol, stopping short of the Algarve in Portugal and you will come across Arcos Gardens Golf & Country Club which is not only home to a super golf course but also a charming hotel that is sure to cater for your every need. The Costa de la Luz is fast becoming one of the go to places in Spain for golfers looking for top class fun on the fairways. Situated in the Province of Cadiz on the Costa de la Luz, Arcos Gardens Golf & Country Club is set among the rolling hills, lakes and winding rivers of the region and looks out over the cliff top town of Arcos de la Frontera. The golf course at Arcos Gardens was built by the same American company who worked on projects from the PGA West Resort in California to the famous Ocean Course at Kiawah Island which is testament to the expertise that went into the creation of this fantastic resort. Arcos Gardens enjoys a location surrounded by quintessential Andalucian countryside. The 18-hole course, set within the 440-acre Arcos Gardens residential estate, has been designed with golfers of all abilities in mind. From supremely talented players to the weekend warrior, golfers of all shapes and sizes will find an enjoyable yet exacting test of golf. Gorgeous villas border a few of the holes but in the main the course offers quintessential Spanish views of nearby olive groves, orange trees, cotton fields, sunflowers and vineyards. 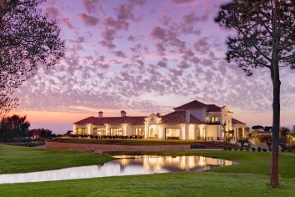 Laid out in two distinct nine-hole loops, Arcos Gardens features wide, forgiving fairways which will delight those who like to open the shoulders and give the driver a ride. Accuracy is important as well though as a plethora of fairway bunkers, water hazards and the odd patch of long, links-style rough await any errant tee shots. The immaculate putting surfaces feature only very gentle undulations meaning breaks are subtle and they are also very well protected by greenside bunkers and lakes which, needless to say, simply must be avoided in order to score well. 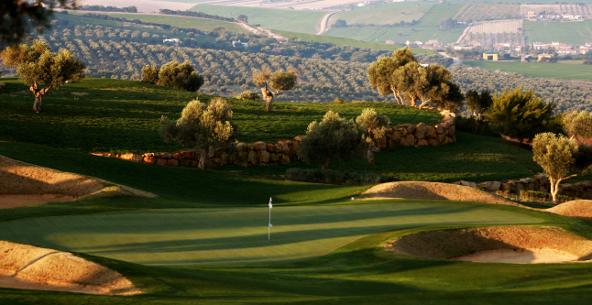 The silky smooth greens at Arcos Gardens are well protected throughout the course. There are a number of holes that will stand out but the final hole on each nine are real classics. The 9th, a reachable par 5 measuring some 520 yards, features a stream that cuts across the fairway twice as it meanders into a pond to the right of the green. While longer hitters will certainly fancy their chances of picking up a shot or two, the presence of water up the entire length of the hole adds a tactical element. Those with limited length will certainly have to think their way up this par 5. If finishing the front nine on such a hole is right up your street then the 18th will really get the blood pumping. Measuring over 440 yards, the par 4 18th is the perfect challenge to end your round at Arcos Gardens. A powerful drive is required to comfortably get home in two and with a sizeable lake lurking menacingly to the left of the green an accurate approach is a must. The course is still relatively young having only been opened in 2006 and yet it has already made quite a name for itself with the Swedish Golf Federation and the English Golf Union choosing it as the base for their winter training. This speaks volumes not only for the quality of the course, which has also been included in Golf World’s list of Top 100 Courses in Europe, but that of the practice facilities and accommodation as well. Top class practice facilities have seen the Swedish Golf Federation and English Golf Union take up residencey at Arcos Gardens during the winter months. The practice range at Arcos Gardens is among the finest in Europe with ten greens to aim at and fairways bunkers to play from. The practice putting green lives up to the quality of those found on the course, which are among the best in Spain by the way, and an assortment of runoff areas and bunkers allow players to sharpen their short game skills before heading out onto the course. If there are a few areas of your game that need some work then this is the ideal place to spend a few days! So what of the accommodation? Arcos Gardens is home to a plethora of accommodation options includuing the Corjito Hotel. This charming hotel is located in an old converted Christian School and olive oil mill and as well as this luxurious and infinitely charming Hotel, guests can also enjoy more private and spacious options in the form of a number of lavish townhouses and apartments. Accommodation at Arcos Gardens is comfortable and stylish, featuring all the modern conveniences you would expect of a top class hotel. Situated between the first and ninth holes of the golf course, these properties are fitted with under floor heating, large lounge areas with flat screen TV’s, dining room and fully fitted kitchens. Whether you are travelling as a group of golfers, a family or a couple, there will be an accommodation option that will suit your needs. What else is there to do away from the golf course? While the course will be the main attraction for travelling golfers, there is a great wealth of facilities and activities on offer at Arcos Gardens. To wash away the stresses and strains of everyday life head to the Spa where you can put the Jacuzzi and sauna to good use before indulging in a variety of treatments including hot stone and Swedish massage. The Spa is a great place to unwind after a long day on the fairways. If you are more of a get up and go type then the sport and leisure facilities at Arcos Gardens will be more up your street. Try your hand at tennis, football, basketball, volleyball, table tennis and more or head out into the surrounding area to sample the delights of hiking, horseback riding, mountain biking, sailing, climbing, spelunking, hot air balloon flights or hang gliding…as the saying goes only stupid people get bored and at Arcos Gardens I think even they would struggle not to fill their time! Sports lovers will be in heaven at Arcos Gardens thanks to a wealth of facilities. If you have had your fill of the Costa del Sol and other golfing hotspots but you still like the sound of fun on the fairways with the sun on your back then the Costa de la Luz and Arcos Gardens is the ideal place to head on your next Spanish Golf Break. 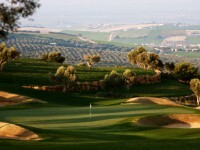 For more information on Spanish Golf Breaks and other European Golf Holidays please visit www.yourgolftravel.com or call free on 0800 043 6644.